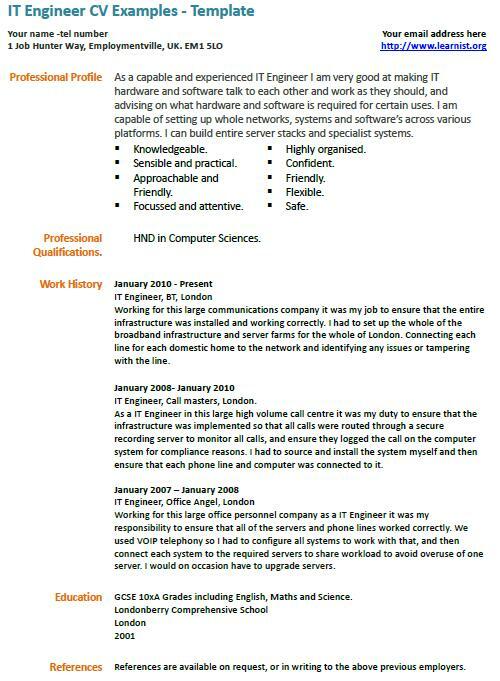 IT Engineer CV Examples – Template. Amend this cv template as suitable and create your own CV in minutes. As a capable and experienced IT Engineer I am very good at making IT hardware and software talk to each other and work as they should, and advising on what hardware and software is required for certain uses. I am capable of setting up whole networks, systems and software’s across various platforms. I can build entire server stacks and specialist systems. Working for this large communications company it was my job to ensure that the entire infrastructure was installed and working correctly. I had to set up the whole of the broadband infrastructure and server farms for the whole of London. Connecting each line for each domestic home to the network and identifying any issues or tampering with the line. IT Engineer, Call masters, London. As a IT Engineer in this large high volume call centre it was my duty to ensure that the infrastructure was implemented so that all calls were routed through a secure recording server to monitor all calls, and ensure they logged the call on the computer system for compliance reasons. I had to source and install the system myself and then ensure that each phone line and computer was connected to it. Working for this large office personnel company as a IT Engineer it was my responsibility to ensure that all of the servers and phone lines worked correctly. We used VOIP telephony so I had to configure all systems to work with that, and then connect each system to the required servers to share workload to avoid overuse of one server. I would on occasion have to upgrade servers.